Robots have been streamlining our lives for decades, but they're hardly known for their glowing customer support skills. Well, Schiphol Airport in Amsterdam is hoping to change all that by introducing a new AI that roams its terminals, guiding lost travellers to their correct destination. 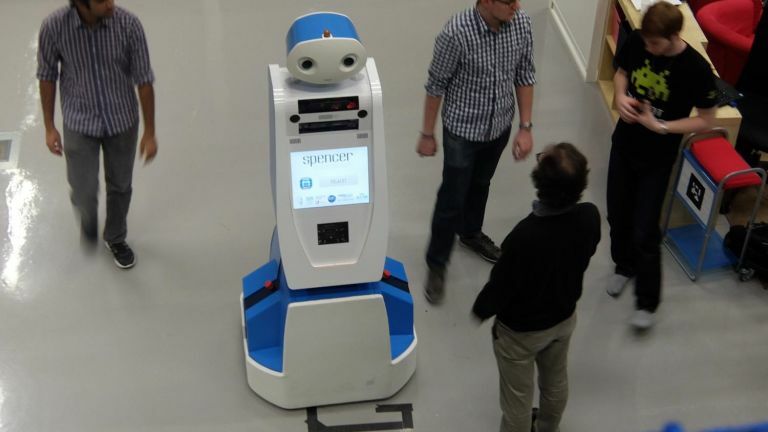 Created in partnership between students at Örebro University in Sweden and theDutch flagship airline KLM (which is also based at Schiphol), the new robo guide - dubbed 'Spencer' - uses a combo of laser guidance and blueprints to navigate the famously labyrinthine terminals of the Netherlands' main airport. "Navigating an airport is challenging, there is a lot of glass and a constantly changing environment in terms of temporary obstructions, such as parked luggage trolleys and people everywhere," comments Achim Lilienthal, professor of computer science and project leader of Örebro University's contribution to the research project. "Objects that are temporarily permanent so to speak, are the most difficult to work around. We do not know, for instance, how long that luggage trolley will be parked in a particular spot, which makes it harder for the robot to determine its own location. We are working on a general map representation that includes and allows the robot to handle temporarily permanent objects." Spencer has been designed to be as agreeable as possible, and will sidestep travellers at a steady speed rather than rushing forwards to help clearly befuddled flyers. The initial trial run will kick off on the 30 November and run for a whole week. The team hopes to use the data to fine tune Spencer before his official full-time debut in March of next year. Building your own droid army is easier than you might think. T3 Agenda: Ubtech's humanoid robot takeover, the most expensive iPhone X case we've seen and more! Rise of the Machines: can home robots really make our lives easier? Don't fear the Terminator just yet.